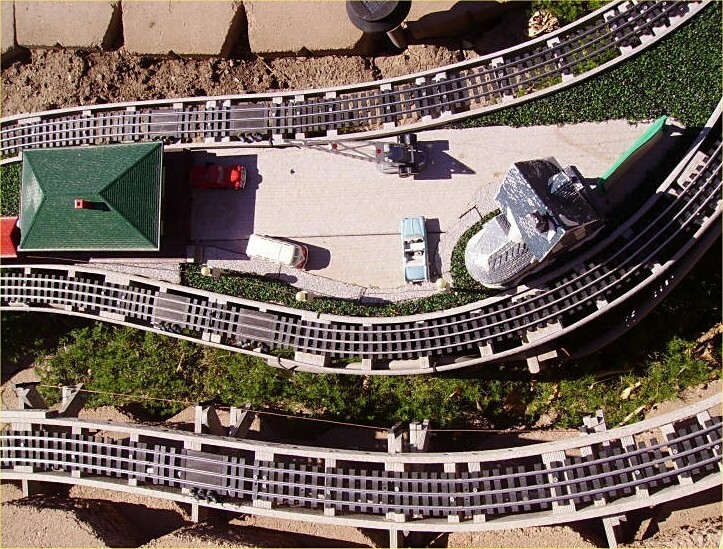 We've been O-gauge railroaders for years, but for this project we decided to move our trains outside. We chose a track system we already had some experience with, but that didn't keep us from running into snags. 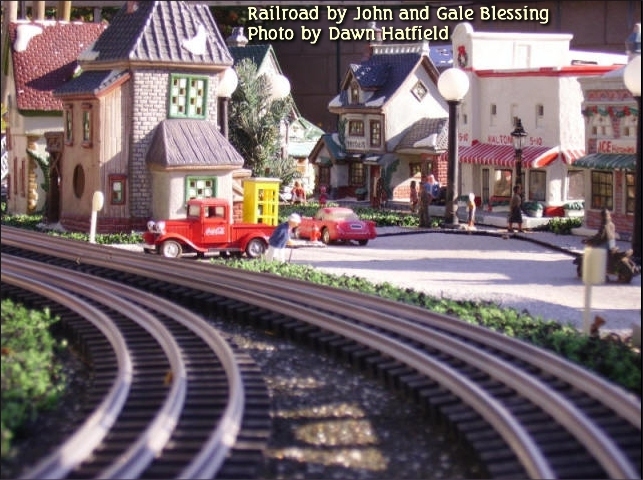 This article is based on our "lessons learned" in our attempts to use Gargraves on an outside O-gauge railroad. As we mentioned in our earlier articles, the Anzira Rail Road (ARR) uses HDPE roadbed similar to that described in Paul Race and Bill Logan's "HDPE Flexible Roadbed" article. 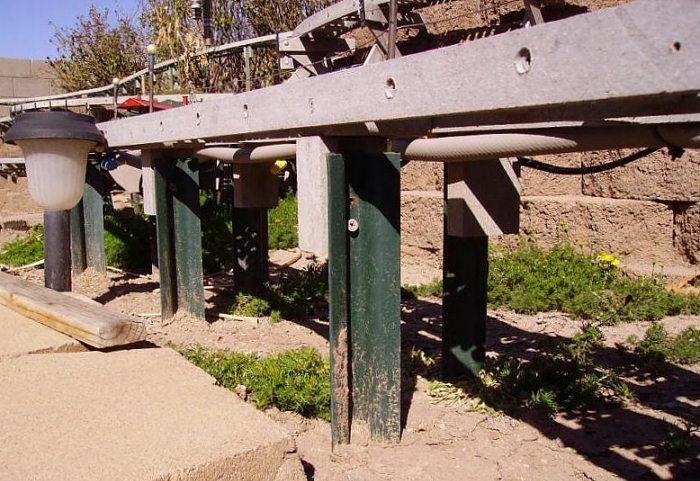 Though what we learned about using Gargraves outside applies to most kinds of roadbed, we'll give a quick review of our system so the rest of the article will hopefully be less confusing. Our adaptations to the HDPE flexible roadbed design. - 95% of our track is supported by an open ladder system based on Logan's design. We did modify Bill Logan's dimensions a little. The Lowes in Tucson carries HDPE in 2"x6" and 1"x10". I reduced the dimensions of the track bed. making the cross members 3" long and the outside rails 5/16 thick. The height of the outside rails is the thickness of the 2x6 (about 1 5/8"). 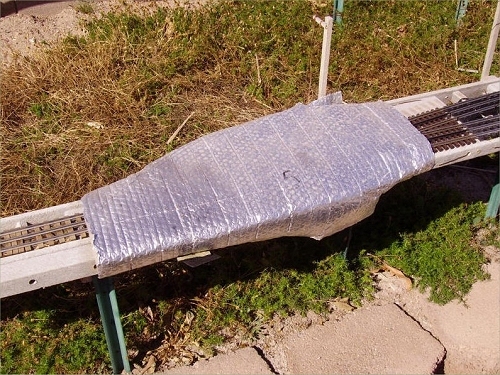 Plan to Ventilate Track in Hot Climates - Where the track is exposed to all day open sunshine there will be a lot of track movement - especially in Tucson where the rails can reach 140 - 160 degrees. Where possible, I let the track "float" on the HDPE ladder "roadbed." The open construction of the ladder helps cool the track. In Tuscon, you really can fry eggs on the patio, so even our so-called "ground-level" track is elevated to allow ventilation around the ties. Because we were going to use some pretty high elevations, we chose to use 6' or longer steel fence posts from Lowes for most of our vertical risers. Depending upon the elevation above ground for the track ladder, I cut the various length fence posts long enough to give the correct elevation, while going into the ground far enough to keep things stable [In northern states you'd want to drive these below the frost line, not a problem in Tucson. - Paul]. 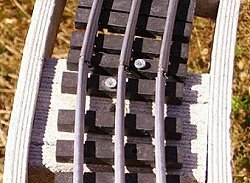 Other Options - Since we began this project, Atlas has begun using UV-resistant plastic ties on their O-gauge, nickel-silver track, which makes them a viable option, although their track will still probably require ventilation in our setting. But except for a couple Atlas turnouts, we used Gargraves, so that's what we're writing about. By the time you plan your railroad, you may have even more options. Plan Lots of Curves to Absorb Expansion and Contraction - The next problem is track expansion/contraction due to outdoor temperature extremes. You MUST allow for the summer heat rail expansion and the winter cold rail contraction. According to a metallurgist, I should expect at least 2 mm of expansion and contraction in each 37" section. Even if you allow 2mm for expansion at every connection, the heat will eat up that gap, especially on straightaways. Screwing your ties down to the roadbed doesn't solve the problem either - the rails creep so that in time you have sections where there is no longer any gap, and sections where you have 4mm of gap (or more). An old timer O-Gauge Outsider told me "curves and curves and curves." 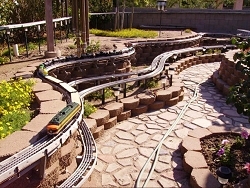 Curves allow the rails to convert the expansion and contraction into lateral movement. The middle part of curved pieces can not be fastened down. It must float on the roadbed. 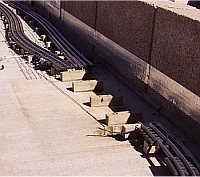 Yet each track section can be secured at its connection to adjacent sections (so the track doesn't go completely awol over time or in high winds). So, typically, I have a screw in one end of each curved section. That allows about 30" of track in the middle of each curve that can move "out and in" with temperature changes. Avoid S curves. Always have a minimum of one foot of straight in the middle of an "S" curve (where you go from a left turn to a right turn or vice versa.) This gives the cars a chance to stabilize before entering the opposite curve. When I have a short straight piece separating an "S" curve, I fasten it down with one screw in the middle. That way, the piece can pivot a little as the curves move in and out with temperature changes, and it doesn't lift off the track in high winds. The curves really help. However, the new sections where I have laid sectional track have not yet been exposed to all day, open sun, so I may have to update this section if the results are different. Track Power Attachment - While you are creating your track plan, don't forget to include your track power attachment points. Soldering to stainless steel was too much of a hassle, so I purchased ready-made track power terminal sections. I installed them every 10 to 15' (approximately - some couldn't go in the optimum placement because they have to go where the track is straight.) If you are planning to use these pieces you must include them in your plans and laying of templates. Preformed Curves or "Flex Track"? Gargraves makes preformed curves in nearly every radius Lionel has ever supplied. On the other hand, their marketing brochures call their big straight pieces "flex track." So why bother buying curves, if you can just bend the track where you need it to go? Because bending three-rail Gargraves curves accurately into small radii is a lot more difficult than they let on. If you plan on using curves with less than 60" radii, consider planning your railroad out and ordering the curve pieces you need already curved. More on that below. Here's a BIG "lesson learned." Initially I made assumptions about how much room the curves would really need and how easy it would be to tweak things if they didn't quite go as planned, based on the marketing brochures and my experience with some, but not all, of Gargraves' products. I designed the initial installation of my railroad down to the last detail ON PAPER. Then I when I built my railroad, I tried laying the system from my blueprint. Oh my gosh -- triangulation, off-set measurements, angles, finding circle centers. . . . and on and on . . .
And when the track pieces came in, nothing fit my roadbed the way I thought it would. Of course that shouldn't be a problem, right? Gargraves is advertised as "flex track," after all. Wrong. 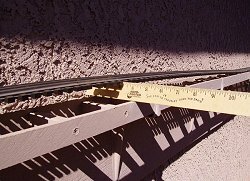 Trying to accurately bend (or rebend) Gargraves sections into radii less than 53" is not for the fainthearted, especially when you have a very large railroad's worth of track to bend. Doing that one job almost took me back to flying radio control airplanes -- forget the railroad. But because I can't see them little aeroplanes out there at 100 yards, I had to stay with pounding steel on the RR. John Henry and I became real close. For the next expansion, I used templates to lay out where the track should go before I staked the roadbed. I have a band saw so making the templates was easy -- what is important with the templates is that the curve is laid exactly and the ends are cut exactly, or else your "plan" in place will still be far, far off from the real track. 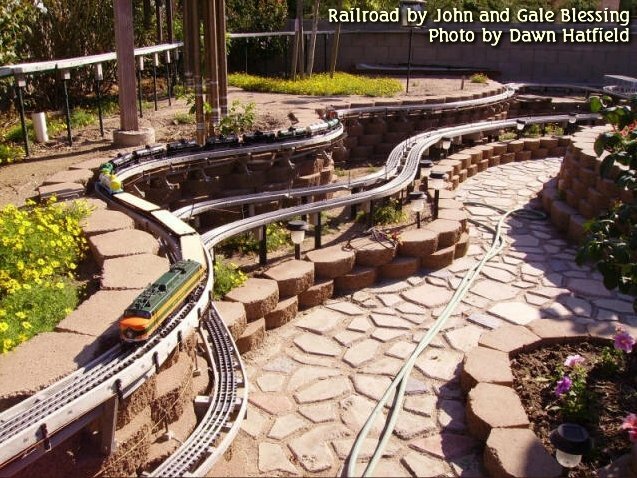 The next time I do this (not likely in my lifetime), I will order one piece of each curve I expect to use and make templates to guide my roadbed construction. The hassle of making and placing exact templates of curves is nothing compared to bending O-54 curves. Once you've figured everything out with your templates, you can make your "real" track order. I do use "flex track" (the kind that comes straight) in between the sectional curves. If I need to bend it a little, I can. Bending WIDE radius curves is relatively easy. Plus, it makes beautiful transitions into fixed radius curves of 113/106 -- not that you need much transition with curves that wide. 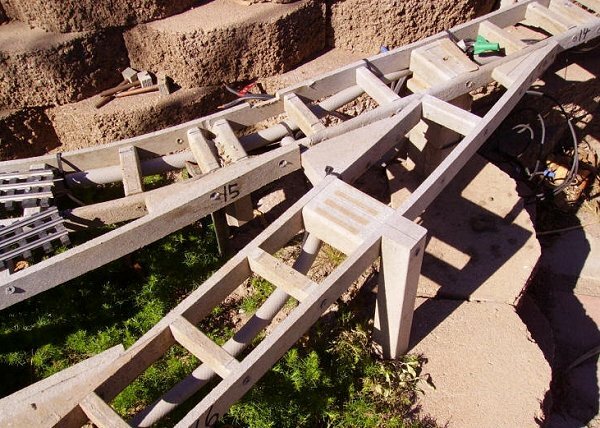 No matter how careful you are when laying the templates, you are going to be off when it comes to placing your ladder roadbed and track. So the flex comes in very handy to make adjustments EXCEPT, JUST DO IT RIGHT THE FIRST TIME. No, I haven't started another railroad, and don't plan to, but, based on our experiences, this process should work for the next person trying this. Order one of each curve you think you might use. Use those curves to make accurate templates so you know where the roadbed must go. Write the radius or track piece # of each template on it in big letters. Lay the whole route out with the templates to make certain you are designing something that can actually work. Take lots of photos with a digital camera so you could recreate it if necessary. Count the templates you used and order your track. While the templates are still down, mark the route with wood stakes. Measure and cut your vertical risers. 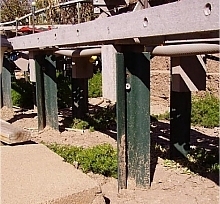 If you use fence posts, cut and attach the 3"x2" "support" blocks that make the connection between the fence post and the "ladder" (see above). After you've built your HDPE "ladder" roadbed, put each curved section in place temporarily, using clamps to hold the ladder and support blocks on the fence posts. 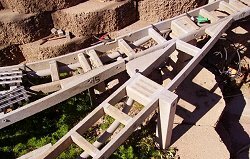 With the curved roadbed sections clamped to the risers, lay the fixed radius track on the roadbed and made sure things are lined up properly. Then you'll know whether or not you're really on track (couldn't resist that one). Finally, when you are connecting curved sections, use flex for the "straight" sections; that allows you to make minor adjustments. 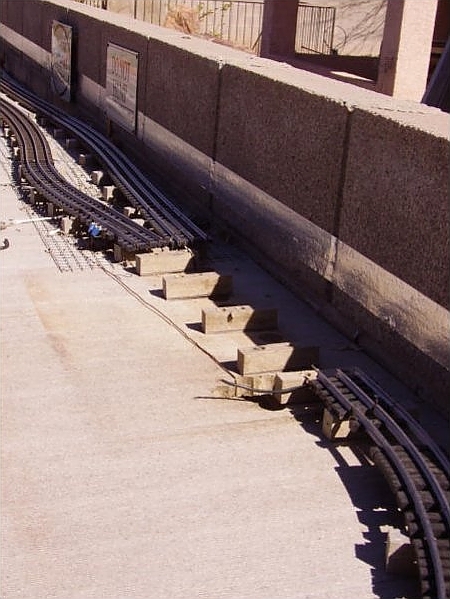 If you lay your track system like that -- oh my gosh it will be sooooooooooooooooo smooth to run trains upon. It's a dream. 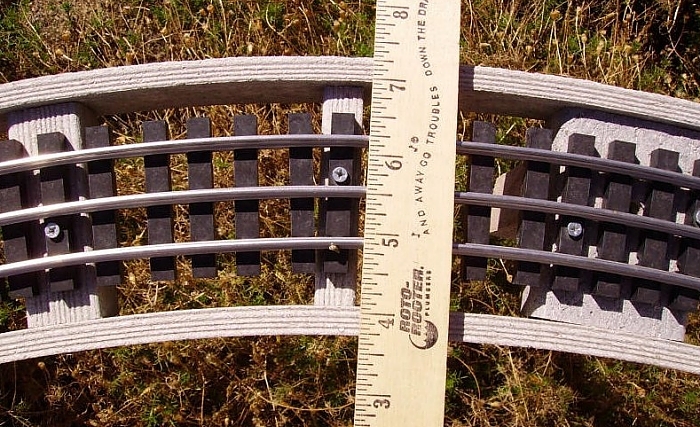 Once you have your roadbed where it needs to be, it's time to pay attention to details of installing Gargraves for a "bulletproof" outdoor railroad. Now that we are using Fit-Ups we are experiencing fewer and fewer lost connections. Also, we modify the Fit-up by placing at least one slight crimp/bend in each half; two bends are better like a zig-zag in each half. This seems to make a more positive rail contact. As we get more and more miles of train running, we are using more and more Fit-Ups, including replacing many track pins in track we have already installed. Lubricate the ties near the end of the track with WD-40. Slide the track ties back far enough to allow placing a Fit-Up. Place a bead of conductive grease in the rail cracks where the Fit-Ups go. Use a Fit-Up to smear the grease down into the rail cracks. Slide the ties back. We place two ties, edge to edge at the very end of the track section to insure a better hold on the Fit-Up. Slide one more tie to the location where the end of the Fit-Up will be inside the rail. This is the 2 ties - 1 tie combination that cinches the Fit-Ups. Now one end of a track section is ready to insert the Fit-Ups. Slide the Fit-Ups back and forth a bit to get the grease on the Fit-Ups. Position each Fit-Up to half of its length in its rail end. 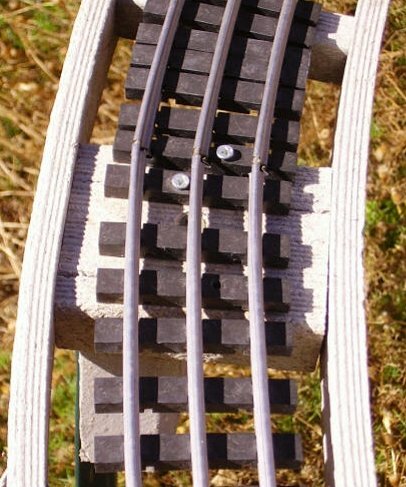 To attach the next track section apply the conductive grease to one end of the track section as explained above, but do not slide the ties back. This end will simply slip directly down and over the installed Fit-Ups of the track section in place. Insuring that the Fit-Ups are up into each rail as far as they will fit; slide the ties to secure the Fit-Ups as explained above (2 ties - 1 tie). Leave Small Gaps Between Rails to Absorb the Rest of the Expansion and Contraction - Living in Tucson, I don't install track until ambient temperature is in the 70s at least. This is a happy medium between the yearly record high and low. Then we gap the sections no less than 2 mm at each end of EVERY joint regardless of that section's length. The rails work themselves back and forth just like a nail or screw that works itself out of fastened materials. 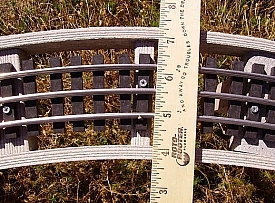 Sometimes the rails of two connected sections are butted up, end-to-end at one end and there is 4 mm gap at the other end. This is seldom a problem as the system self-adjusts over time. We've never had derailments due to the gaps [since the Fit-Ups or track pins are still in place - ed]. We have never mastered soldering to stainless steel rails, so, all power drops to tracks are to GarGraves terminal track sections at 10 to 15' intervals. All electrical wire is underground to the point where I must go up to the track. I use 12 gauge, landscape wire, with soldered joints at connections and underground, irrigation grade wire nuts for insulation of the splices. I've only had one joint go to ground. All wire bundles larger than 2 wires are protected with landscape plastic edging over the top prior the refilling the wire trench to protect the wires from future spading or shovel nicks. Any wire run of two to three pairs go into cheap 5/8" garden hose before burial. Again, this is to protect the wires from future damage. Some wire runs installed on the underside of the track ladder are placed in cheap garden hose because of sun exposure. I've had some landscape wire of poorer quality degrade in the sun in one summer. All future wire additions will go under the ladder as I'm not digging any more. I almost can't anyway, as trenching will disrupt so much stuff. Wipe The Track Often - The track MUST be wiped clean before running of trains; even if you just ran trains the day before. Track can get very dirty in a short time due to the stuff in the air. Troubleshooting Outside Gargraves Track Problems - Any time you have trouble with an engine not wanting to run along a section of track as it should, go through all the regular checks and then suspect loss of internal rail conductivity due to degraded track end connections. Since O Gauge Outside track is exposed to water, track connections degrade at what seems to be an alarming rate if you don't use Fit-Ups and conductive grease. 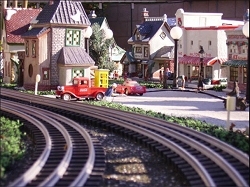 Turnouts are the "weak link" in most model railroads, for several reasons. Outdoors, they can be even more problematic than they are indoors, though. Mechanical and Conductivity Issues - Trains are more likely to derail on turnouts than anywhere else. Locomotives are more likely to experience a break in current on turnouts than anywhere else. And turnouts outside seem to be magnets for any bit of gravel or twig that can clog or jam it up. For those reasons alone, place all of your turnouts within easy reach. You will almost certainly need to make more visual inspections and more minor maintenance than you're used to. UV Issues - Even though Gargraves' plastic ties are supposed to be UV-resistant, I've had issues with their turnouts. Early on, I sent all of our GarGraves switches back to GarGraves for retro-fit to the new die-cast points. Factory inspection of the switches revealed that two of the turnouts that had been exposed to the sun without any protection had become so brittle that they couldn't be serviced - they had to be replaced. [If you see premature degradation of the plastic ties, you might consider taping over the rails, frogs, and points, and spraypainting the ties with UV-resistant paint - ed]. Control Issues - Here is the really big issue - if you want to use Lionel TrainMaster Command Control (TMCC) to control your turnouts, you'll discover that nobody makes the equipment you need to do this outdoors. We have mostly tried using GarGraves switches, though we have a couple of Atlas 7.5 degree, high speed turnouts. After trying several options, we settled on Z-Stuff for Trains DLZ-2500 switch machines, because they respond to TMCC signals, the technology we use to control our trains. We kept the DLZ-2500s protected from the weather between sessions by wrapping them in "aluminum insulation wrap," a sort of reflective bubble-wrap material. At first, the 2500s had trouble moving the old style GarGraves points. They seemed to work better on turnouts with the new die-cast points. The Atlas high speed turnouts worked very nicely with the 2500s, when the 2500s were working. Unfortunately, they get glitchey, too, eventually, no matter how carful I am to protect them. I've also looked into Del-Aire, which are impervious to moisture, dust or UV, because they're really just little pistons powered by air. Unfortunately, they don't respond to TMCC signals. I've looked all of the other switch machines that are TMCC-compatible; none seem likely to hold up to outdoor use even as well as the DLZ-2500s did. Another Option: Factory-Painted Ties/Bases on Gargraves Turnouts - In addition, another sunbelt garden railroader, Bob Canfield reports that Gargraves has offered to paint the bases for their turnouts before they assembled them. Bob thinks a lighter color would help the Gargraves turnouts hold up better in his blistering back yard. 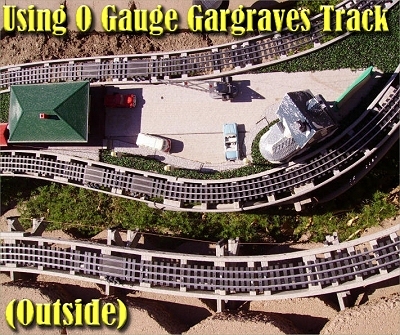 So if you want to go with Gargraves turnouts, and your back yard resembles a pizza oven in the summer, consider this option when ordering your track. Paul speaking: We should probably have thrown out all the stuff John tried that didn't work and just published a nice straightforward set of instructions that made everybody look good and made you feel brave about your next project. But I figured that, since O Gauge Outside is still in its infancy, it's worth sharing John's "snags" as well as his solutions. In the meantime, though you may have sensed some frustration in different parts of this article, you should know that the Blessings and their friends have had countless hours of relaxation and pleasure from their railroad. Recently, I learned that the Blessings have had further problems with their track; again the problems seem to be related to the extreme climate in which they are operating. I'll keep you posted on anything else you may find helpful. I'll also see if I can get more details from Fred Young, who seems to have found some good solutions for some common problems. And if you have any successes or failures that your fellow hobbyists can learn from, please drop me a line. If you have a question for the Blessings, just let me know and I'll pass it on.